When they founded Chavurah B’Yachad in 1986, our members had a vision of what a congregation could be: a participatory setting for the exploration of our Jewish roots and carrying forward of our traditions, a forum for intellectual and spiritual growth, an extended family to celebrate life cycle events. We are a congregation of thirty families, including some of those founding members who led our 25th anniversary celebration in June 2011. We hold services in the lovely Pepper Chapel at Congregation Kol Ami. 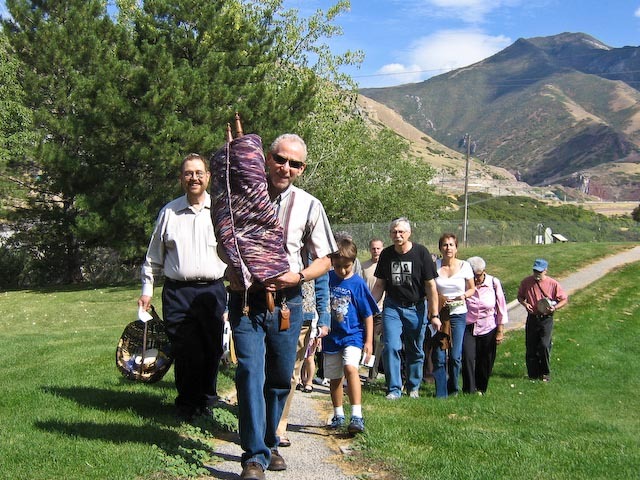 Rabbi Stephen Booth-Nadav travels to Salt Lake City from his home in Denver at High Holidays and other times each year to lead our services and enrich our community. Moving our Torah into its home in the Pepper Chapel. For Reconstructionists, Judaism is more than Jewish religion; Judaism is the entire cultural legacy of the Jewish people. Religion is central; Jewish spiritual insights and religious teachings give meaning and purpose to our lives. Yet our creativity as expressed through art, music and drama, languages and literature, and our relationship with the land of Israel itself are also integral parts of Jewish culture. Each of these aspects provides a gateway into the Jewish experience that can enrich and inspire us. While deeply connected to the historical experience of the Jewish people, we find a profound sense of belonging in our contemporary communities as well. This connection often leads to increased ritual observance and experimentation with the ritual rhythms of Jewish life. We find meaning in rediscovering the richness of traditional ritual and creating new observances which respond to our contemporary communal and personal cycles. Participation is a vision that challenges us still. Our Shabbat services are lay-led. We do a lot of singing and talking together during the service as a way to create a spiritual community that transcends the individual. Reconstructionists believe that each person is transformed through active participation in an alive community. Throught this participation, Chavurah B’Yachad allows everyone an opportunity for Jewish commitment, creativity, and spirituality. All are welcome at all services and events while exploring possible membership in the congregation. Our members consist of born Jews, Jews by choice, interfaith families, and gay and lesbian families. Please use the Contact Us form to get in touch for more information, thanks!